Arbors, mandrels, hole saw arbors, hole saw mandrels, arbor pilots, pilot drills. Hole saw diameters 1 3/16" and smaller have 1/2"-20 threads. Hole saw diameters 1 1/4" and larger have 5/8"-18 threads and can all use arbors with drive pins, except for the Relton hole saws shown at the bottom of the page. Hole saws are shown on our Hole saws page. F1510 is a MK Morse quick change arbor with a 1/4" hex shank. 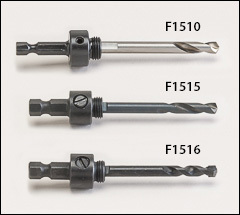 F1515 and F1516 are Disston quick change arbors with a 3/8" hex shank, with either a high speed steel or a carbide tipped pilot drill. All pilot drills are 3 1/4" long x 1/4" diameter. These arbors have 1/2"-20 collar threads. Disston quick change arbor with a 3/8" hex shank. Includes a 3 1/4" long x 1/4" diameter high speed steel pilot drill. This arbor has 5/8"-18 collar threads. Drive pins on these Disston arbors lock the saw to prevent over tightening. 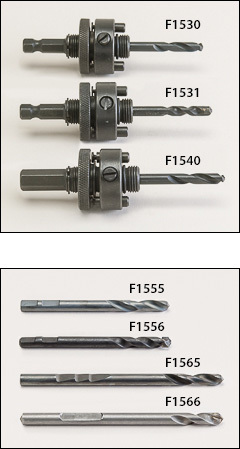 Please note that the F1540 has a 7/16" hex shank that requires a 1/2" chuck. The other two are Disston quick change arbors with 3/8" hex shanks, with either a high speed steel or a carbide tipped pilot drill. All pilot drills are 3 1/4" long x 1/4" diameter. These arbors have 5/8"-18 collar threads. for use with any of the arbors shown above. Both the 3 1/4" and 4 1/4" drill lengths are available in high speed steel or carbide tipped. WARNING: Proposition 65 Label for F1566 . 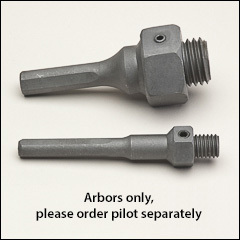 These arbors have different arbor threads and only fit the F16XX heavy-duty carbide tooth hole saws. Please order pilot drills separately from list below. WARNING: Proposition 65 Label for Relton arbors and pilot drills . for H, I, J, K, L arbors listed above. Pilot drills are not included with these 5 arbors. Please order pilot drills separately.